2015 has been a great year for Project Janszoon, and our partners, and I have been delighted to see us moving more into the restoration phase of the project. It was humbling to have everyone’s hard work recognised on both the national and international stage this year. We were able to celebrate our wins at the 2015 Green Ribbon Awards in June and the Green World Awards in October alongside representatives from DOC and the Abel Tasman Birdsong Trust. These awards are a recognition of the collaborative work that is being undertaken in the Park so a huge thank you must to go to all those contributing their time, energy and enthusiasm. A major milestone was releasing kaka and this will be the first of many kaka releases over the next few years. We are also looking like we will have around 20 kakariki to release in January which is wonderful and testament to the good work of our experts and the four breeding aviaries. These bird releases are only possible because of predator control and we plan to extend the stoat trapping network next year to the north of the Park. The prospect of a beech mast is also looking stronger than ever so we are preparing for that eventuality. 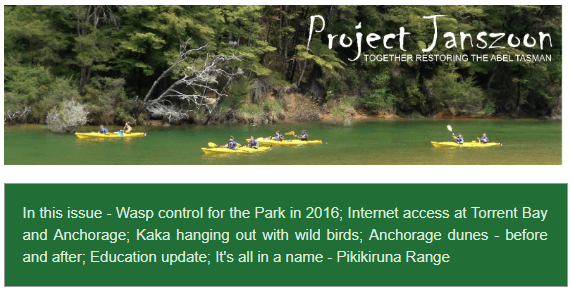 Weeds are definitely in our sights and the Abel Tasman Birdsong Trust is supporting the focus on the Park’s problem plants. Our “Adopt a Section Schools” are bringing more students into the Park and it is great to see the student leaders step up as part of our Student Advisory Board. Thanks to DOC staff and management for their hard work and support over the year. I wish everyone, including the concessionaires, adjoining landowners and the Janszoon team a safe and happy Christmas and New Year.